Adrian Piper, Funk Lessons, 1983, still from a color video, 15 minutes 17 seconds. SHORTLY AFTER GRADUATING from Harvard with a Ph.D. in philosophy, Adrian Piper began to teach. She lectured, scribbled on chalkboards, and gave precise instructions: Here’s how you do the shoulder shrug and head nod; this is how you isolate your hips while thrusting your pelvis. 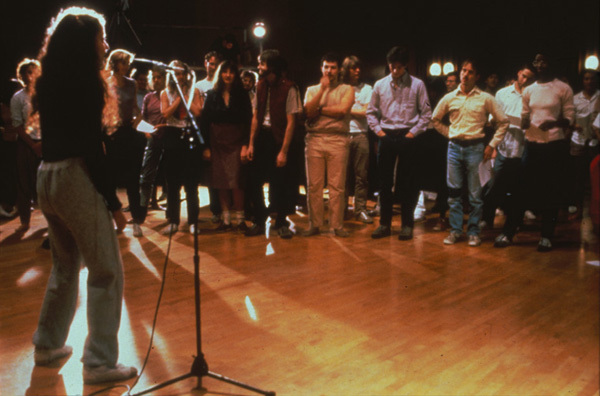 Piper called these performance-lectures Funk Lessons, 1982–84, and she used them to address xenophobia, an issue increasingly central to her art. Under the guise of a “get down and party together” affair, she began to teach white, primarily art-world audiences about the histories of African-American funk and soul music. Yet the lessons also underscore that “at least some perceived racial distinctions are learned, and learnable, behavior,” as critic Holland Cotter notes. A nearly fifteen-minute video directed by Sam Samore in 1983 shows Piper giving her lessons to a large and noticeably diverse audience at the University of California, Berkeley. The work is intercut with soft-focus shots from Soul Train, sound bites of the cheerful artist interviewed postlecture, and clips of singers like James Brown and Aretha Franklin that support Piper’s improvisational points (“What Chuck Berry was for Elvis Presley . . . Bootsy [Collins] was for the Talking Heads”). Meanwhile, didactic phrases like FUNK IS MODULAR and FUNK IS IMPROVISATIONAL are overlaid in static, character-generator-driven text. Funk Lessons and a selection from Piper’s Shiva Dances with the Art Institute of Chicago (2004) play at the Maysles Cinema on January 29 at 8 PM; a dance party will follow. Artist Monica Carrier organized the screening as part of her fellowship at AIR Gallery.